The elite athlete and real estate agent shares eight pearls of wisdom from her experiences training (or not!) through it all. Two years ago, Sara Vaughn captured the attention and admiration of running fans across the country when she overtook six women in the final lap of the national championships 1500 meters to place third. Her finish earned her a spot on Team USA and a trip to London for the 2017 world championships. It was Vaughn’s second time representing the U.S. Her first was in 2012, at the indoor track and field world championships—but that was also two children and a full-time job ago. 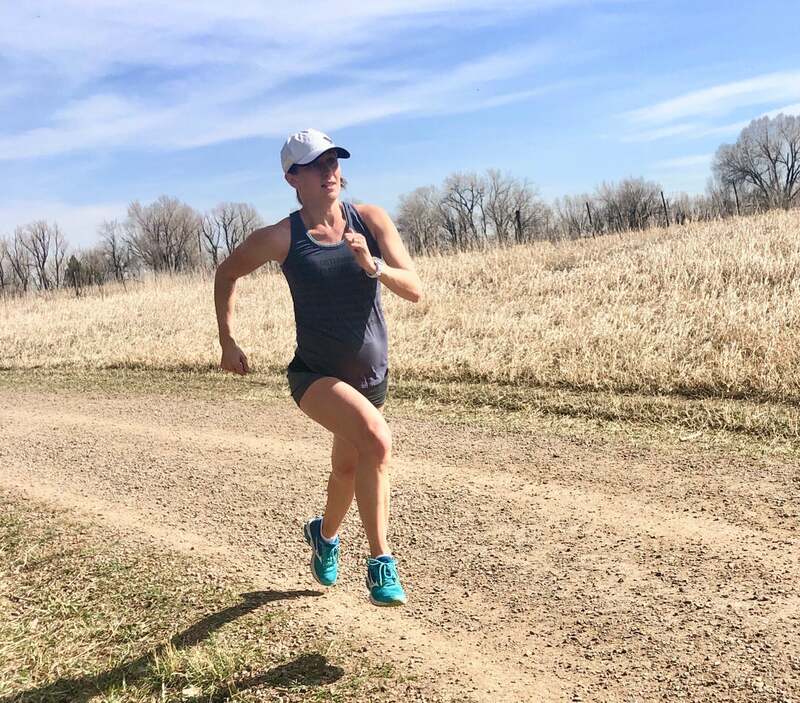 What made her 2017 performance so heartwarming is that it marked Vaughn’s third postpartum return to running, this time while working as a real estate agent and, along with her husband Brent Vaughn, parenting three daughters, in Boulder, Colorado. And now Vaughn, 32, has announced that she’s pregnant with a fourth child. “Every relay needs a strong anchor!” she quipped on Instagram—though we’ll have to wait until September to find out whether they’ll field an all-girl or a coed squad. Let your body dictate your activity. Vaughn ran every day of her first pregnancy with daughter Kiki (now 12), when she was a student and member of the University of Colorado track and field team. She was 20 and bounced back quickly afterward, but each subsequent pregnancy—with Calia (8) and Cassidy (3)—has had its own challenges. “It’s way easier to be pregnant at 20 than 32,” Vaughn said. Each time, Vaughn has tried to let her body decide how to proceed with running. In her fourth pregnancy, the first trimester was dominated by morning sickness, so she ran a total of three times. Instead, Vaughn opted for no-impact ElliptiGO rides when she felt like it. “You don’t lose everything in a year,” she said. If anything, the forced pregnancy breaks she’s taken about once every four years have allowed Vaughn to remain exceptionally durable when she does come back to regular training. She’s got the post-baby results to prove it. Seek wisdom from women you trust. Vaughn credits Shayne Culpepper, two-time Olympian and fellow University of Colorado grad, for helping her establish a healthy perspective during her first pregnancy. The Vaughns were student-athletes when they had their first child, and Culpepper was training in Boulder at the time. Beyond offering an exceptional mother-runner example—including a national cross-country title, a second Olympic team, and a bronze medal at the indoor world championships, as a mom—Culpepper’s dialogue made a lasting impact. While other people might have questioned Vaughn’s return to high-level competition with an infant and a full course load, “Shayne was like, ‘Of course you can. Why not? !’” Vaughn ran with that advice, and encourages other women to seek out the kind of support they need from like-minded women who have been in their shoes. Vaughn has found those first 14 days are critical for allowing her body to recuperate after such a grueling experience. And she also focuses that time on bonding with her baby. After that? She maintains a flexible attitude and doesn’t rush back to any activity. While Vaughn was able to start running relatively soon after having her first baby, now she typically waits a total of eight weeks before easing back into it. During those two months, “Baby and Me Yoga” class is her only form of exercise—and a welcomed excuse to leave the house. Be open-minded about your comeback. If her first three pregnancies taught Vaughn anything, it’s that projecting the future is futile. Every person—and pregnancy—is unique, and so is each recovery process. So rather than mapping out upcoming seasons and goals, Vaughn has learned to keep an open mind about her post-pregnancy timeline. Most memorably, that relaxed approach culminated in a seventh-place finish in the 1500 meters at the 2016 Olympic Trails—just 11 months after giving birth to Cassidy, she felt ready to mix it up with the country’s best. Focus on realignment and strength first. Vaughn learned the hard way, after her second delivery, that there is a proper progression when it comes to training hard again: Realignment, strength, and stability should come before speed, power, and aerobic work. That year, she jumped back into spikes and attempted an indoor season before her body was ready. She paid for it with a couple months off soon after. In hindsight, she would have been better off taking her time spiking up and getting her body in a good, strong state first. “Just because I can run a 200 in 28-29 seconds doesn’t mean I should,” Vaughn said. Embrace the season. One key to Vaughn’s success across her many roles is accepting what life gives her. Twelve years ago, that meant expanding her identity from a runner and a student to a mother as well. More recently, it’s meant striking a balance between her girls’ needs and activities (which include dance, gymnastics, soccer, and running), her own schedule as a real estate agent, and her husband’s routine as the owner of a construction company. Then, of course, there’s all of her training on the track, and trails and in the gym. In about five months, Vaughn will allow the scales to tip naturally, as she backs off work and training in order to focus on her newborn and their changing family dynamics. It’s a mindset of embracing the season she’s in, and this one is all about motherhood. You do you. Whereas most of her competitors are full-time, sponsored runners, being a stay-at-home mom was never part of Vaughn’s plan. She doesn’t believe that parenthood, professional athletics, or a traditional career must be mutually exclusive. In fact, Vaughn’s running résumé has only grown alongside the size of her family. More importantly, so has her sense of purpose. “My girls watch me working hard toward big goals, they’ve gotten to see the world through my racing, and they’re seeing that I haven’t compromised myself and my ambitions,” she said. Vaughn hopes that message sticks with them—and their youngest sibling—for many years to come.